even if it optional.. the name GTi i think they should replace ar.. not suitable..
so replace with just G or GT, no I, hehehehehe. At lease enhanced the engine, suspension and give it a better rim and tire. Don't just make it look nice but every other things is the same, also dont simply re badge it to GTI but nothing special except the bumper. 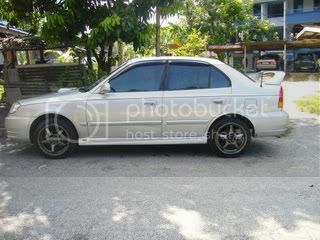 At lease proton satria GTI also have larger engine and better suspension also have semibucket seat and momo steering. Dont know wat they are thinking. if G.. later same with Accent_G hehehe.. name la Accent SR ke.. they got Accent SR what outside..
i hate this version (especially the fake scoop, at least put in a REAL scoop laaa..), weakens the Hyundai brand perception and cheapens the image of my basic Accent. ropai, the air scope is not a compulsary, you can have the body kit and asked them not to put the air scope......you dont like it, why you want it installed ? 1.5L SOHC 12-valve EFI, 92 hp@5500 RPM and 132 Nm@2900 RPM, need an air scoop? EKEKEKEK.....BUT WE STIL BUY IT BRO. Next thing u know, got Accent STi (Impreza version), Accent Modulo etc etc... I think my big bro, jamesc can do a great job in designing the bodykits than Hyundai! EKEKEKEK........I LOVE TO SE THAT DESIGN..AM WAITING..hope the design will impress most of us here....uhhhuuuuuu...lets do it bro. yes, but i bought it simply because it was THE CHEAPEST, NEW CAR, NON-PROTON SEDAN in MALAYSIAN market. it's not like i had other choices... it should be cheaper IMHO. secondly they should increase the engine capacity to 1.6 or 1.8 and sell it as a performance car with 16 inches rims. Interior should give momo gear know for manual and momo steering for all, semibucket seat (recaro or bride) like in Satria GTI. Better sound system. Than only name is as GTI version of hyundai accent. nak perabih stok kot, shame...with others company(Honda,Mitsu,Toyota).Kerana nila setitik rosak susu sebelanga!